‘Anyone watching the performance would have witnessed the sheer joy from the participants in the way that they approached the singing and instrumental playing.’… and the joy has continued for us as we’ve looked back on a project we’ve greatly enjoyed delivering and evaluating! In 2014, Redbridge Music Education Hub commissioned Sound Connections to manage the Redbridge Special Schools Creative Music Project. Weekly music workshops took place in four schools over three terms, led by Sound Connections Associate Artist Graham Dowdall, supported by Roshi Nasehi, also a Sound Connections Associate Artist, who led vocal sessions. Seth Newman, a percussion tutor, shadowed Graham. The project focused on creative music making using instruments, the voice, and a range of accessible music technologies. Using Vivaldi’s Four Seasons participants had the opportunity to explore the seasons, take sound walks, compose new music, and explore a wide range of sounds and ideas. 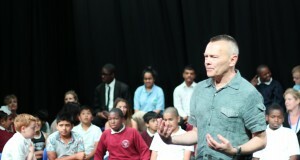 The project culminated in a showcase at Redbridge Drama Centre on 8th July 2015. A taster session at the Sound Connections Challenging Circumstances Conference: ‘Taking Off’ on Tuesday 17th November 2015. A 1-day masterclass focusing on ‘Creative Music Making in SEN Settings’ on Wednesday 3rd February 2016. As a result of the project, the schools are keen to continue running creative music workshops, introducing weekly sessions as an integral part of their students’ learning. We’re pleased to be able to share the evaluation report we’ve written for Redbridge Music Service. Read all about the project and the report here. Looking for a project evaluator?